Shiina Ringo is back in Nov 2013! https://www.japanconcerttickets.com/dev/wp-content/uploads/2013/09/ShiinaRingo.jpg 640 640 JapanConcertTickets https://www.japanconcerttickets.com/dev/wp-content/uploads/2018/02/Japan-Concert-Tickets-Logo.png JapanConcertTickets2013-09-12 14:55:142019-02-19 08:00:02Shiina Ringo is back in Nov 2013! First of all: if you want to start your 2014 seeing Blur in Japan, you better act quick! Entry for the third ticket pre-sale lottery at Ticket Pia runs until Sep 11th, 11am Japan time. I’d be very surprised if this show doesn’t sell out, as it is the first and only Blur gig in Japan since Summer Sonic 2003. Update (2013/11/17):　The show is sold-out now, but there are tickets available through auctions and resale platforms. If you live abroad and/or don’t speak Japanese, we can help you with your purchase. ->Contact us for a quote. Update (2013/12/03): A second show has been announced on January 13th! See our new blog entry for more info. Creativeman, the official organizer and promoter of the gig has announced normal ticket sale to start on October 5th, 10am. Blur will be playing the venue called Budokan, in the center of Tokyo, where they also recorded their first live album in 1996. This indoor arena holds approx. 14’000 people and has been chosen for live recordings by many artists of world fame since the 1970, including Bob Dylan, Mr. Big (twice), Ozzy Osbourne, and Dream Theater, among others. Seeing these pictures, you will probably agree that it’s quite a special place to see a concert. 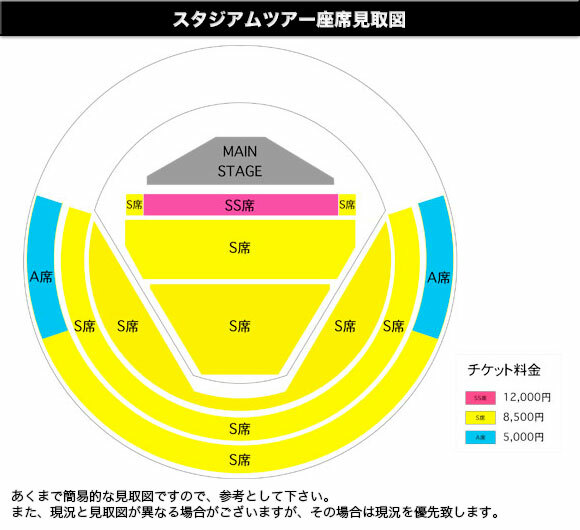 The seating layout of the Budokan hall can differ from concert to concert, and no map has been published for the Blur concert. My suspicion is that the layout is made according to the number of sold tickets. However, the cheaper A seats are usually the 10-20 percent of the seats from which the stage is rather hard so see, such as the sides near the stage or sometimes even behind the stage. If unlucky, you will not be able to see much of the stage or the screens (here you can see an example of a layout from a past concert at the Budokan). Moreover, the ticketing process doesn’t let you choose the specific seat number. To be sure you have an acceptable view, I’d thus go for the S seats. Doors open at 18:00, the concert starts at 19:00. Better don’t be late, as concerts in Japan usually start very punctually! If you want to buy tickets from abroad, check out the How To, or order through the JCT Ticket Service.